More Gift ideas for Men; the good, the bad, not any ugly gifts or men! With the season to be jolly around the corner, we thought this might be a good time to tell you about some more of our lovely Men’s Gifts. Gifts for Him…. and get you thinking! 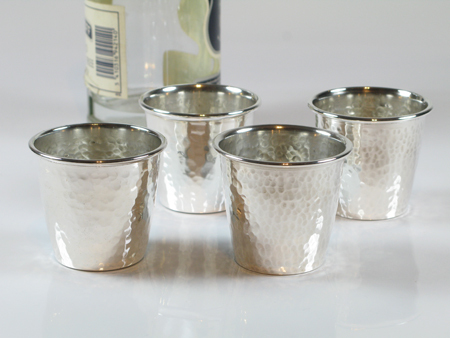 Barware or bar accessories – every stylish bar needs them! Wonder why buying gifts for the men in your life is so nerve wracking? They’re not like your women friends, mums, or daughters ( I’m assuming you’re a woman, I’m not judging you!) I think most men are fairly frugal (really!? ), extremely fussy or just don’t think too much about material goods until they need them or if they’re connected to a hobby, and then they want them NOW! Whenever I need to find a Gift for a Man; my brother, husband, man friend, a young man’s graduation present I’m filled with dread – “What can I possibly give him that he will like, use or appreciate?” I shriek with regular monotony, much to my family’s irritation! At Tiffinware we try to solve these perplexities; we’ve been designing Gifts for Gentlemen for a few years now and try add to the range as often as possible. We have a few goodies here; to accessorise a bar, dressing table or desk. 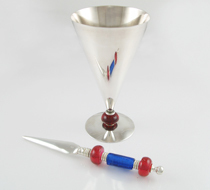 Lets start with the all important desk; we have a marvellous stylish silver-plated Cone Pot for housing pens and pencils and the Paper Knife, or Letter Opener, as seen here. These days everyone seems to be into shots, (not the one’s you smile for, oh, actually you do!) so we made Shot glasses! 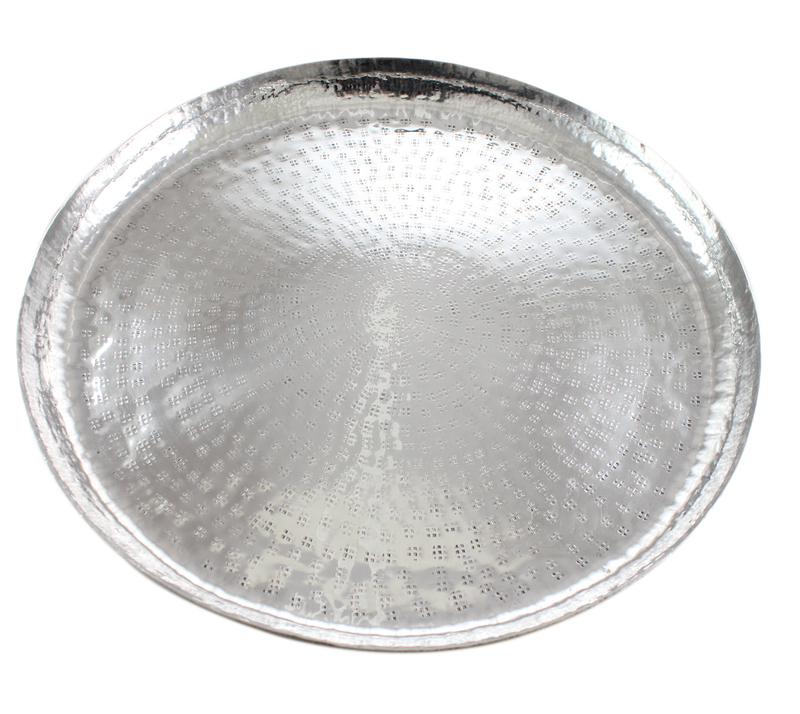 A Large Drinks Tray, with a lovely hammer finish, perfect for the bar; serving cocktails, canapés or just to house your bar accessories. Every best dressed bar should have one! 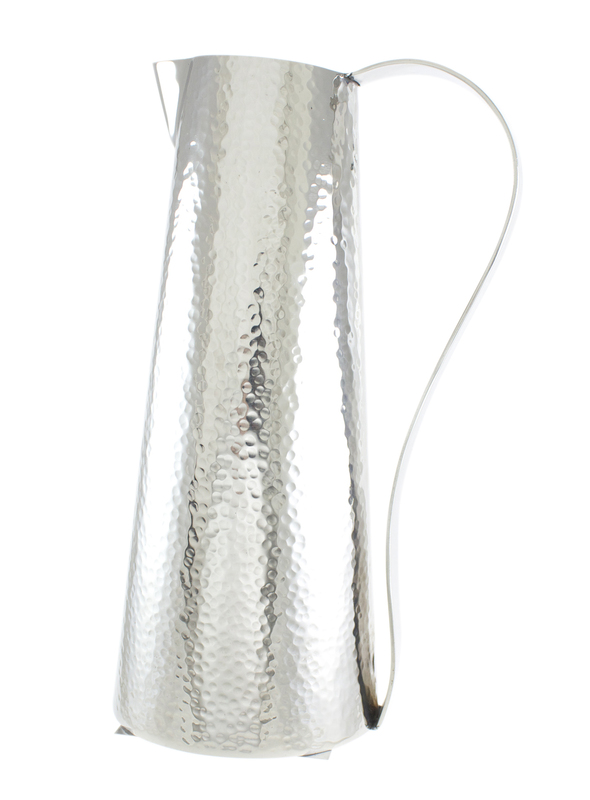 A hammer finish Water Jug or Pitcher, perfect for Pimms, Sangria or water!! Entertaining? Serving olives and other canapes, nibbles, snacks? 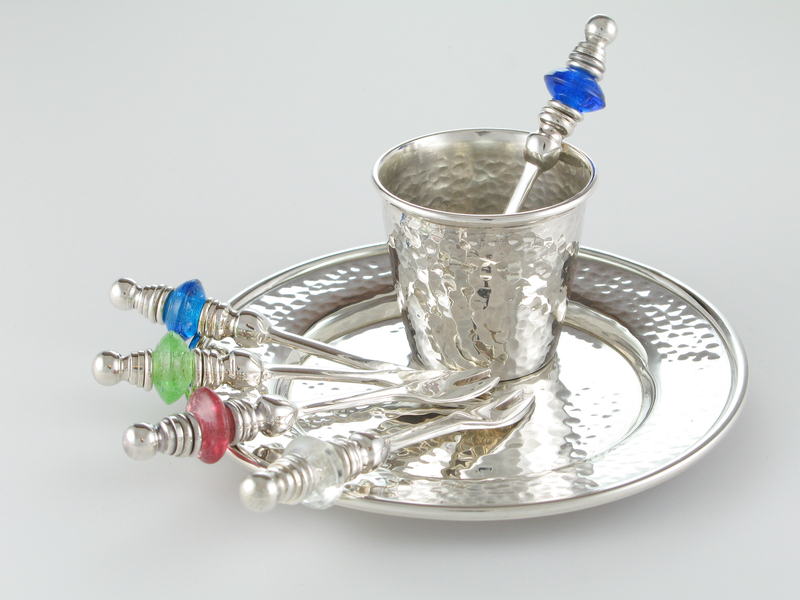 We have this lovely little Olive serving set; a small Salver or dish for your olives, a Tumbler housing the multi colour glass beaded Olive Forks. 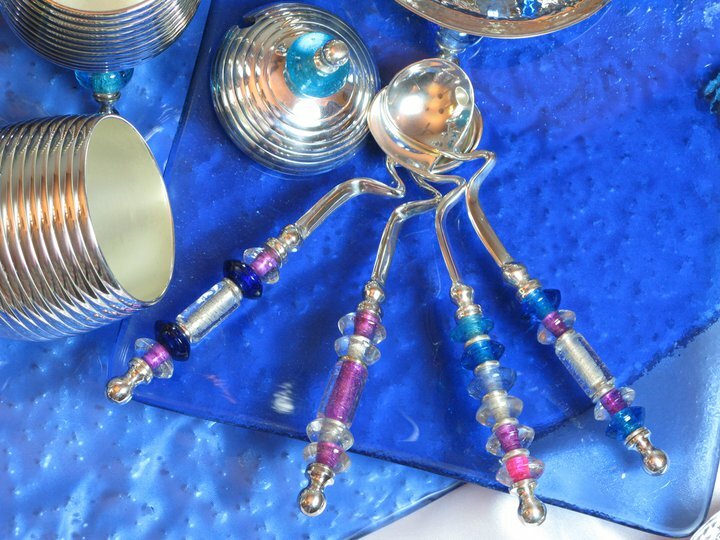 The Tumbler then becomes the receptacle for the olive pits and the brightly coloured glass beads on the forks or picks, help everyone identify their own Olive Fork! Perfect! 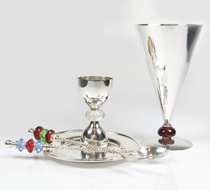 Nibbles with drinks; serve olives at your parties in this fabulous set made especially for little tasty treats over a cocktail. Love cheese? Chutney and pickles with his cheese? Here’s a couple of lovely accessories for the cheese board; a Pickle Fork and a Chutney Spoon would make a great and different gift. If he loves cheese and pickle, then this is a great gift for him! 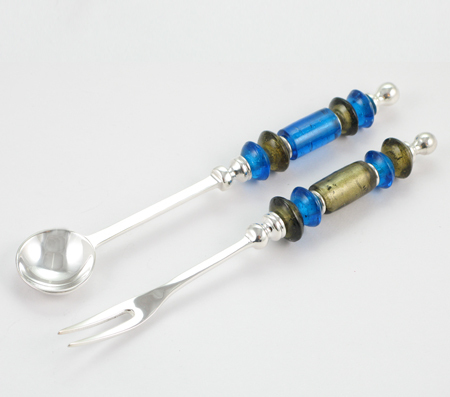 A beautiful pair; Chutney Spoon and Pickle Fork, both handmade with interchangeable beads so your gift can be customised. 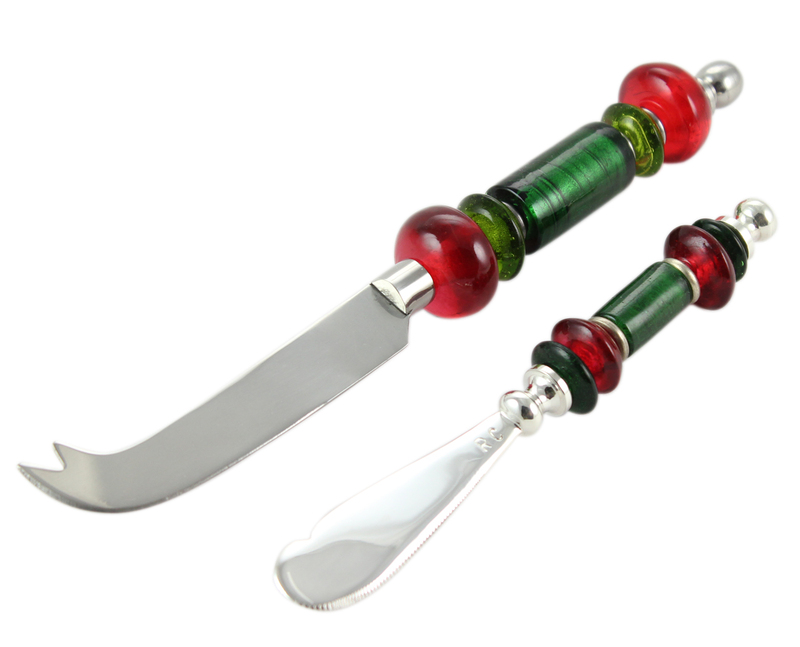 The Long handled Jam or Chutney Spoon makes a lovely gift and attractive cheese accessories on the Cheese Platter. This multi-purpose Spoon is extremely versatile and lends itself to many uses; for latte, ice coffee, serving jams, chutneys and most importantly as your own personal ice cream spoon – you couldn’t give him a nicer gift, after all who doesn’t like ice cream? And this way it can be eaten elegantly straight out of the tub! 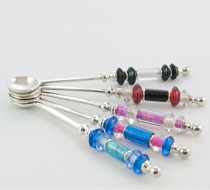 Multi-purpose, long handled Round Spoon, suitable for iced coffee, latte, serving jam, pickle or chutneys or as your personal ice cream spoon – to personalise just choose your favourite colour glass beads and we’ll make it up for you! 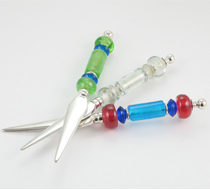 Alternatively a Cheese Knife and Butter Knife for your cheese course. Hand made Cheese Knife, seen here with a Butter Knife with a matching handle. 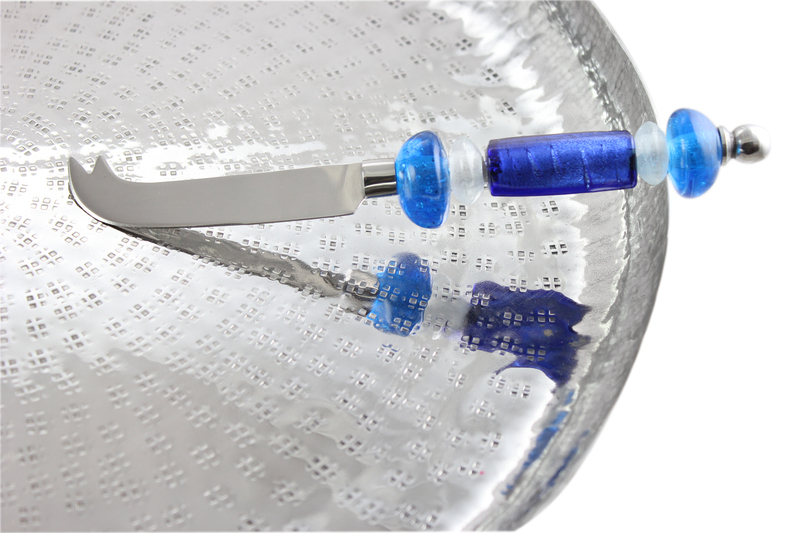 All our items can be personalised. Does he like honey, jellies, PBJ’s (peanut butter and jelly sandwiches!) not Pj’s! Here’s a fab spoon for serving honey – a ‘wiggly stem’ Honey Spoon – what more can we say? Pass the honey, Honey! We hope you have enjoyed our little trip through the by-lanes of Gifts for Men, we would love to hear what you think of our designs or about any interesting ideas for us for future products. Visit us at http://www.tififnware.com and leave a message – we love to hear from you.